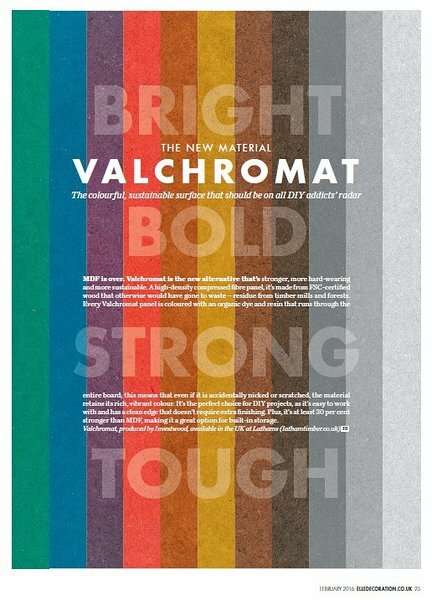 Elle Decoration UK named Valchromat one of the trend marks for the Spring-Summer 2016. Valchromat® Engineered Coloured Wood was one of the brands chosen by Elle Decoration UK, magazine of worldwide reference. This publication chose the brand as one of the trend marks for the Spring-Summer 2016 supplement "Trend Issue", in the February 2016 edition. Valchromat was chosen as The Material of this new season. The magazine refers to the product as "The colorful, sustainable surface that should be on all DIY addicts’ radar" and sets it in four aspects – Bright, Bold, Strong and Tough.